David Berkshire, LAc, has been teaching NUNM’s Doctorate of Oriental Medicine and Masters of Oriental Medicine programs for over ten years, is the co-founder of two integrative medical clinics and an expert on five element acupuncture. 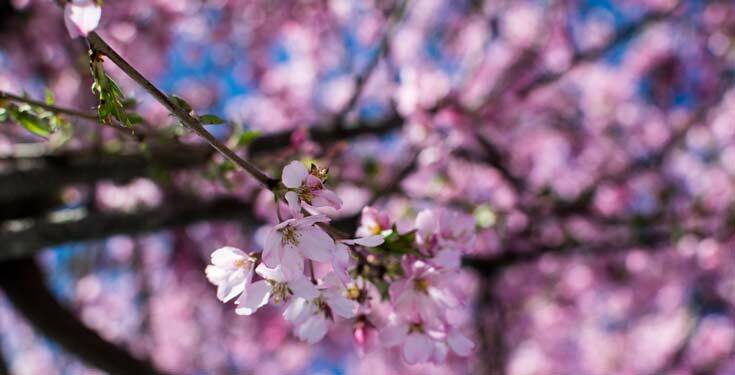 Here David discusses the impact spring has on our bodies, minds and spirits, and what Chinese medicine recommends during this spring season. It’s spring time! And we are slowly rising out of our winter hibernation. Even the name “spring” reflects the nature of this season―to move forward, to rise out of hibernation. The season of spring is when the buds burst forth on the trees; the flowers push their way out of the earth; the seeds crack open with new growth. All of life is in a state of blossoming, expanding its energy, and growing. The very fact that we have a spring gives us hope that there will be a harvest later― which will carry us through the next winter. There is a plan that nature has given us to sustain our lives. There is nothing like the longer days of spring to remind us of this. Classical Chinese medicine recognizes that the health of the body is dependent on all the laws of nature. We are part of, and considered a reflection or microcosm of, the broader natural flow or macrocosm of nature. Chinese medicine practitioners look to nature to help them understand how to treat their patients. They start by looking at the season, then the element, then the organ systems to determine which acupuncture points to focus on, and what herbs (if necessary) will support these organ systems. The Chinese described five elements or phases that reflect the movement of the seasons, which are referred to as the “Law of Five Elements.” The five elements are wood, fire, earth, metal and water. Within the five elements, one element correlates to each season (spring, summer, late summer, fall and winter). The Chinese saw spring as reflected in the element of wood. If we look at bamboo as one type of wood we see this strong, forceful growth that reaches to the sun while sending its roots deep into the earth. The flexibility of bamboo allows for it to flex and grow in all directions without becoming damaged. Spring is the season for this growth to begin― for the buds of the trees to come out, for the bamboo to ‘spring’ forward. The element of wood contains the virtues of flexibility, growth, vision and the assurance that comes with a plan for the future. How Does Spring Affect Your Health? Each of the five elements are reflected in both an organ system within the body, and in a meridian that runs through the body. The liver and gallbladder organs and meridians are reflected within the season of spring and the element of wood. What that means within Chinese medicine is that all the aspects of spring and the wood element show up within the microcosm of these organs within the human body. Since we are looking well beyond just the detoxification and metabolic aspects of the liver and gallbladder organs, we recognize that these organs are functions that reach across the body, mind and spirit of each individual. The liver is often considered the architect―the organ who manages the internal plan within us. The gallbladder is considered the decision maker―the organ who has the courage to act. You can see how important the element or spring and these organs are in our lives! Can you imagine if you had no idea of what the plan for your future was, or couldn’t make a clear decision? How would you get up in the morning? How would you know what to do at work or in school? That sense of being lost with no direction would extend into all aspects of our lives; a sense of feeling disconnected from the spirit within us that supports us could also feel lost. We are part of nature and part of a natural process. In this season of spring, it is time to utilize this wood energy. Support your liver and gallbladder through herbs and acupuncture. Work with your acupuncturist to determine the best plan for you. Make clear plans and set goals with clarity. Utilize your decision-making capabilities to grow your goals with flexibility while reaching for the heavens, just as a plant does in spring. Tend to your spiritual health through self-care and meditation, which will help you if you are feeling directionless. Rejuvenation will follow. Interested in learning more about Chinese medicine, acupuncture and herbs? Request more information about NUNM’s Classical Chinese medicine programs. Study Chinese Medicine and Acupuncture at NUNM.